Mode D (degradation failure): degradation of the organic material. Such failures usually occur later in life. Mode E (early failure): insulation defects due to a processing problem. These failures tend to occur early in life. The variable Hours represents the number of hours until a failure, or the number of hours on test if the sample unit did not fail. The variable Mode represents the failure mode: D for degradation failure, E for early failures, or Cen if the unit did not fail (i.e., is right-censored). The computed variable Status is a numeric indicator for censored observations. Figure 12.27 contains estimates of the combined failure mode survival function at the times specified with the SURVTIME= option in the PPLOT statement. 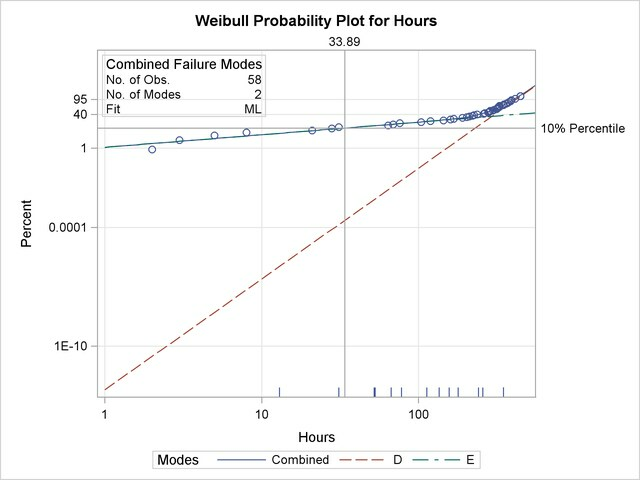 Figure 12.28 shows Weibull parameter estimates for the two individual failure modes. 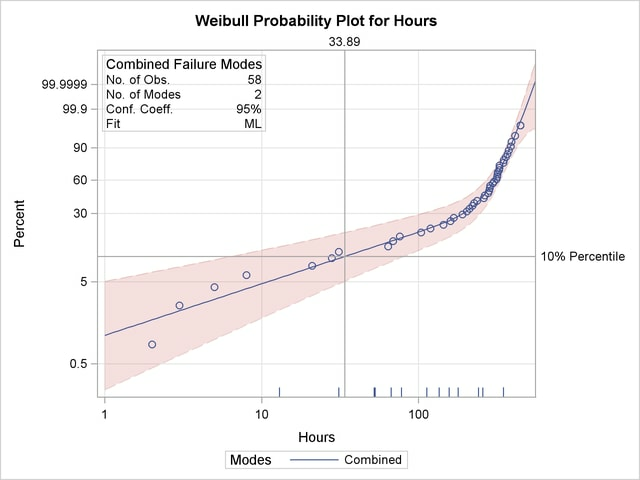 Figure 12.29 is a Weibull probability plot of the failure probability distribution with the two failure modes combined, along with approximate pointwise 95% confidence limits. A reference line at the 10% point on the vertical axis intersecting the distribution curve shows the 10% percentile of lifetimes when both modes act to be about 34 hours. The PLOTMODES option in the FMODE statement cause the Weibull fits for the individual failure modes to be included on the probability plot. The combined failure mode curve is almost the same as the fit curve for mode E for lifetimes less than 100 hours, and slightly greater than the fit curve for mode D for lifetimes greater than 100 hours.